MINI Cooper Acccessories + MINI Cooper Parts :: OutMotoring.com MINI Blog :: MINI Performance Parts :: Is your MINI equipped with Junk in the Trunk? Buying a used MINI can be scary, especially if the previous owner(s) were not to careful about putting things away where they belong after being used. Of course, the worst time to find out that the jack is missing is when there is a blizzard out and you're on the side of the road cursing. Double check the 'junk in your trunk' and make sure all the tools and jack are there...the jack, the lug wrench and all of the other widgets and what-ja-majiggies. If you're missing some, chances are we have it listed here... and if not, just drop us a line and we'll see what we can do to get it for you. 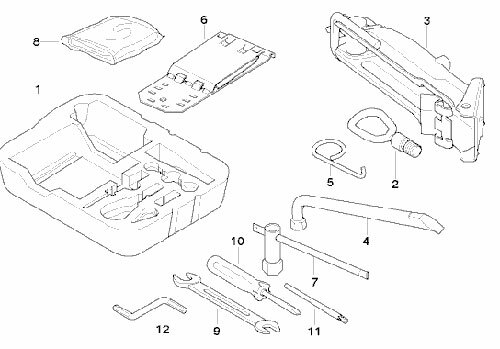 Please note that the "foam tool insert" shown in the pic (#1) is also available in a large size that fits the R55 Clubman and nests AROUND/on top of the spare tire area with multiple tool cavities on the top. If you do not have the spare, this will still work and should you get the spare wheel/tire later it will fit perfectly. We also have the large plastic threaded nut and stud that hold the spare to the chassis listed on the drop down menu as well (#13). Comments on Is your MINI equipped with Junk in the Trunk?